Background: Direct ethanol fuel cells have gained considerable attention as promising sustainable green power sources for portable electronic devices and automotive propulsion systems. The electrocatalyst is one of the key parameters in DEFCs. However, the current electrocatalyst still suffers from high price due to a relatively large amount of noble metal used, or relatively low activity if non-noble metal was employed. Therefore, the design and fabrication of high-efficient electrocatalyst with low-content of noble metal is still of interest. Methods: Ni(OH)2 nanoflakes supported ultra-low content of Pt (Pt/Ni(OH)2) electrocatalyst was obtained via microemulsion, impregnation and chemical reduction processes. The Pt/Ni(OH)2 electrocatalyst was characterized by SEM, TEM, XRD and FTIR, and its performance for ethanol electro- oxidation was evaluated by cyclic voltammetry, Tafel and current-time curves. Results: TEM result showed that Pt NPs with sizes of ca. 4-6 nm were highly dispersed on the Ni(OH)2 nanoflakes, indicative of the successful preparation of Pt/Ni(OH)2. No peaks related to Pt NPs were observed in the XRD pattern of Pt/Ni(OH)2, revealing a low content and/or high dispersion of Pt NPs. 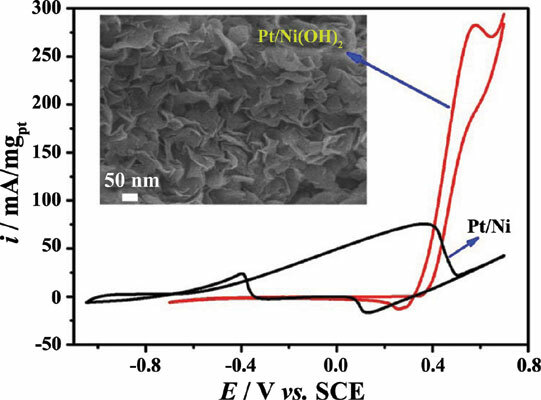 The electrochemical investigation showed that the Pt/Ni(OH)2 electrode presented a superior catalytic performance and stability for ethanol electro-oxidation in alkaline solution. Conclusion: The Pt/Ni(OH)2 electrode with nominal 0.62 wt.% of Pt was successfully synthesized and showed an excellent catalytic activity and stability toward ethanol electro-oxidation mainly due to its porous structure, high dispersion of Pt and formation of NiOOH facilitating oxidation of ethanol. The acetate species was the major product during ethanol electro-oxidation. Nanocomposites, Ni(OH)2 nanoflakes, direct ethanol fuel cells, ethanol electro-oxidation, electrocatalyst, supported Pt nanoparticles (NPs), Pt/Ni(OH)2 electrode.